Since its foundation, the Society of Jesus has placed a strong emphasis on the importance of missionary work. Such work can mean travelling across the world, and spending one’s life on the move, between villages and towns, an unfinishable task. It can take a lifetime and in the end can take your life. 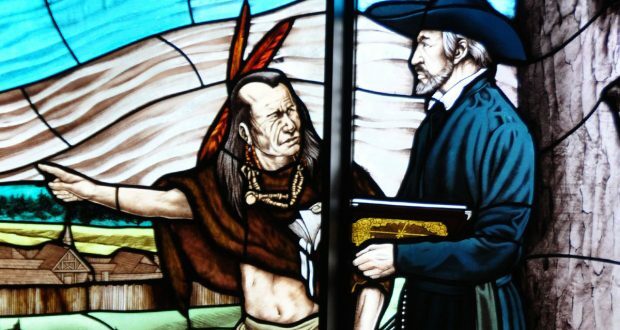 Saint Jean de Brébeuf spent much of his life with the natives of North America, and in the end was executed for his faith. Jean de Brébeuf was born in Normandy in 1593, and joined the Society of Jesus at the age of twenty four. Studying at Rouen, Brébeuf showed a great aptitude for language. He was ordained in 1622 and served as Steward at the college for three years, until in 1625 he was chosen to embark on a mission to New France. Arriving in Quebec with four other Jesuits, Brébeuf lived first with the Montagnais indigenous people before being assigned the following year to the Huron people. Gifted with languages, he was able to learn their tongue, which granted him some acceptance among them. He learned about the practises and beliefs of the Huron people, so as to find some common ground between his beliefs and theirs, as they were generally unreceptive to Christianity. Forced to return to France by the English in 1629, Brébeuf spent four years in Rouen and at the College of Eu before he was able to return to New France, where he spent the rest of his life living with the Huron. Learning more and more of their culture, Brébeuf wrote the first Huron dictionary, as well as composing the Huron Carol, a Christmas song. However, as well as bringing goodwill, the European travellers also unknowingly brought diseases such as smallpox and dysentery, which had devastating effects on the Native Americans. The Iroquois were longstanding enemies of the Huron, and when it seemed likely Brébeuf would be captured and killed at their hands, he chose to remain with the weakened Huron rather than flee. In 1649, he along with another Jesuit, were at the mission village in Saint-Louis when it was attacked and destroyed by the Iroquois. Brébeuf and Gabriel Lalemant were both subjected to ritual torture at the hands of the Iroquois before being murdered. So calm and stoic was Brébeuf during this that after he was executed the Iroquois drank his blood in order to obtain his courage. Jean de Brébeuf and Gabriel Lalemant were two of eight Jesuit missionaries who were martyred during the war between the Huron and the Iroquois. Saint Jean de Brébeuf was canonised in 1930 and declared a patron saint of Canada.